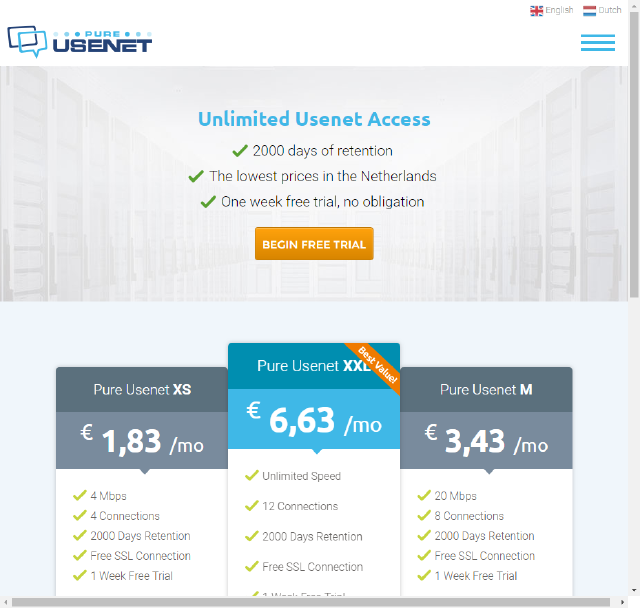 PureUSENET will give you a free trial for 1 week. If you like it, you start your subscription automatically as soon as the week is up, but you can cancel at any time during that period and avoid paying a subscription fee. There are none available at present. The pricing plans for this provider are as follows. You get unlimited downloads with any of these plans. Each of these plans comes with 1,100 days of retention. This provider does not offer block access plans. The servers for PureUSENET are located in Europe. If you want to stay off US-based servers due to privacy concerns, this might make them a good option for you. They protect downloads with 256-bit SSL encryption. The provider offers the SSL downloads over Port 563. If you want to download without protection, you can do so over Port 119. This provider prices its plans based on the number of connections you can make to their servers and your total speed. For some users, the lower connection plans might actually be more than adequate, as not all computers can handle more than 8 connections and the speeds are fast. Right now, this provider only has pages available in Dutch. They do, however, offer a contact form, an FAQ and personal customer service if you have to escalate an issue. You can email support, as well. PureUSENET has decent retention rates, though they’re lower than some of our top providers. Their servers are reliable. Use SSL encryption over Port 563 to ensure that you’re not compromising yourself. If you want to run without encryption, however, there is that option. The servers being located in Europe may be advantageous for some users. The unlimited access is a very nice feature from this provider. Their prices are low, so you might be able to save some money by getting fewer connections with one of the lower prices. PureUSENET offers competitive prices and a good service. They may be a good option for those who want to take their business outside of the US. Keep in mind, however, that their page and FAQ can be hard to use if you’re not a Dutch speaker.